I’ve been fascinated by the robotics industry, and a workshop taught by Professor Sato has brought me a lot closer to understanding the this industry. The class focuses on understanding and developing a systemic approach to deploying social robotics in North America, targeted at specific industries such as health care, mobility and home support. The class has given me the opportunity to try to understand the evolving industry of robotics and its potential application to our everyday lives. There is no universally accepted definition of what a robot is. The word comes from the Czech word “robota” for “forced labor” and was first used in a 1920s play .. Robots can of course conjure up images ranging anywhere from massive, world destroying machines to the lowly robotic vacuum cleaner Roomba which is currently in 3 million U.S households. American and Japanese experts both have different interpretations of the word, but I prefer the one cited by Joseph Engelberger, widely considered the father of Robots, who said “I can’t define a robot, but I know one when I see one”. Why don’t we have robots doing our laundry already? It is interesting to note the parallels in development between computation and robotics. Both computers and robots emerged in nascent stages fifty years ago, and in the past half century, computers went from calculating trajectories for naval shells to becoming the supercomputers of today. In comparison, robots have advanced relatively little; clearly, creating intelligent robots seems to be a more complicated problem. Early “roboticists”, however, felt differently and have been predicting for over a half century that robots at home, performing mundane tasks, would be just around the corner. So why has it taken so long? It’s certainly not hard to create robots that can repeat tasks within a fixed area such as in an industrial manufacturing setting, a capability that has existed for the past 20 years or more. What is hard, however, is to create robots that can exist within a social context. 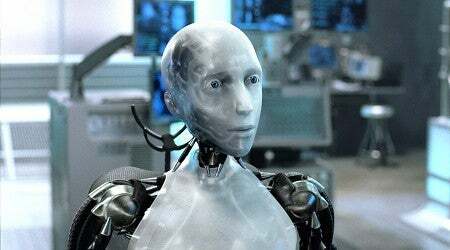 Social robots depend on the ability to see, to walk, to hear and respond, without every specific environment having been programmed into the robot’s brains. It is these abilities that most humans take for granted that have proved the most challenging to mimic in robots. Why should designers care about robots? Much like the computer industry in its infancy, the development of the robotics industry has been led by researchers in universities trying to “situate the robot” in it’s environment. This means solving challenges such as refining robots’ ability to walk. recognize the environment, adapt to change, and understand the semantics of language. Researchers have recently, however, begun to commercialize their research and apply robotics to social contexts such as home care, healthcare, mobility, and search and rescue. Moving the development of robotics from the lab to the home provides a real environment to develop their abilities to situate themselves. It is here that designers can play a valuable role, for the ability to develop “user centered” applications of robotics will differentiate companies in this space. Another challenge to the acceptance of social robots within households is due to cultural preconceptions. Unlike computers[P1] , which were integrated into society with few societal preconceptions, many societies have already been introduced to the idea of robots through popular literature and movies. These cultural influences have colored the reception that social robots will get when introduced to society. For example, the Japanese practically grew up with the notion of humanoid robots and have very different perceptions and preconceptions of robots than their European and North American counterparts. They are perfectly comfortable with the idea of humanoid and friendly robots. However, mention the word “robots” in North America and the inevitable reference to killer robots will emerge. Trying to observe and understand the cultural perceptions and preconceptions of social robots will therefore be crucial in successfully finding applications of robots within these societies. The robotics industry, while in development for half a century, is still relatively in its infancy and faces a number of challenges in the years ahead. Besides the technological and cultural hurdles to overcome, questions remain unanswered regarding their economic and environmental impacts as well as the ethical issues of human and robot interaction. What is obvious is that robots, whatever form they take, will increasingly play a role in societies around the world and that the ecosystem of services and capabilities will offer increasing opportunities for designers in the years to come. Robotics is an interdisciplinary field that combines disciplines such as artificial intelligence, biomimicry, computation and cognition, nanotechnology, biology & bionics and many more. Here are some examples of interesting cross-discipline research currently ongoing in robotics:Bionics: The discipline of studying nature to learn principles and apply them to develop more efficient mechanical machines which has lead to advances in gripping technology through the study of geckos. Self replications / Self-evolution: Instead of programming how robots should walk, etc – provide robots with the ability to self-generate a model of their behavior in order to allow robots to evolve walking motions which could allow them to continue to operate when they are damaged. Behavioral Robotics: For over three decades, the approach to developing social robots was to assume that they had to use sensors to create an accurate representation of the world, and to plan carefully, their navigation and interaction in the world. However, this approach would fall apart if the carefully constructed model was changed before the robot could interact with it. Rodney A. Brooks, head of MIT’s robotics lab and current CTO and co-founder of iRobot studied the behavior of insects and realized that they were able to do some amazing tasks with a very limited neural and cognitive capability. Using these insects as an inspiration, he developed the “subsumption behavior” model of robotics which layers basic behaviors onto each other and which allows robots to more accurately respond to a changing environment. 3. Flesh and Machines by Rodney Brooks. This entry was posted in design, future, products, robotics, user centered. Bookmark the permalink.